When I joined the BBC from university in 1971 there were four BBC radio stations and three television stations supplying broadcast content to a UK population of 55.9 million. In 2018 broadcast content is available on 600 TV channels from Sky TV, from five national and 40 local BBC radio stations, from around 250 commercial radio stations, and from more than 8000 internet stations via Radio Garden - do explore that latter resource if you are not familiar with it. Additionally narrowcast content is available from a comprehensive range of music streaming services and via social media platforms that together have a UK user base of 44 million, with Facebook alone having 39 million users. Moreover all this content is available 24/7, whereas in 1971 broadcasting hours were limited. This exponential and inmeasurable explosion of content - much of it music - from seven primary sources to more than 44 million diverse sources parallels a population - i.e. audience - growth of just 19% from 55.9 to 66.6 million. It is an immutable law of economics that when supply grossly exceeds supply, prices crash - evidenced by low cost music streaming and free live concerts on social media - and cost pressures force quality to pursue price in a relentless chase to the bottom - evidenced by dumbing down. So it is not surprising that the culture grey-out predicted by Alan Lomax in 1972 has arrived, and, as he forecast, a mismanaged, over-centralized electronic communication system is imposing a few standardized, mass-produced, and cheapened cultures everywhere. As another realist Colin Eatock explained recently "what is best is what sells the most", or as perceived value plummets even further, what is best is what can be give away to the largest audience. My headline of 'Let's face it, culture is screwed' is not tasty click bait. With audience sizes hardly better than static and with content sources continuing to breed like rabbits, it is absolutely certain that cost and therefore quality will continue to plummet. So until content supply is curtailed, and there is zero chance of that happening, culture as defined by quality and value is screwed. And this failure of aspiration is, inevitably, reflected in live performances. Colin Eatock also observes that "There are some determined “elitists” who steadfastly oppose this trend". Thank goodness there are; but the hysterical screaming of more than 44 million content sources trying to grab the attention of an audience not much bigger than 44 million means that anyone trying to stand firm against the tide of greying-out is simply swamped by it. Alas, all we can try to do is give a tiny shout-out to those who have not yet been swamped. Which is what this post will try to do. Varanasi, or Benares as it is also known, is one of those 'thin places' where as the Anglican writer Donald Allchin described, the barrier between this world and the world of the spirit dissolves. Varanasi's proximity to the subliminal has produced a great flowering of culture, and not all of it predictable. 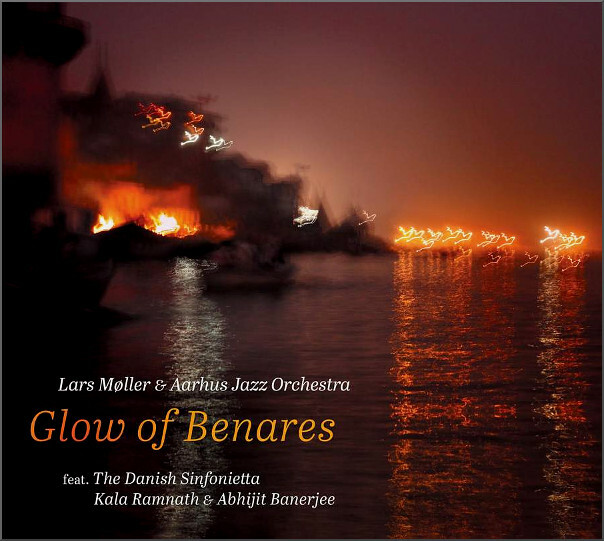 One notable example of the unpredictable flowering is the Glow of Benares project which brings together two leading Indian classical musicians, the Danish Sinfonietta, and the Aarhus Jazz Orchestra under the direction of Grammy-winning saxophonist and composer Lars Møller. In the early 90’s Lars Møller spent time in India studying under Shahnei-teachers Pandit Anant Lal and Pandit Daya Shankar. A later visit to Benares with several Danish musicians produced the video footage seen below which inspired Glow of Benares.